Tome Sperlinger reading from his Romeo and Juliet in Palestine on Thursday. 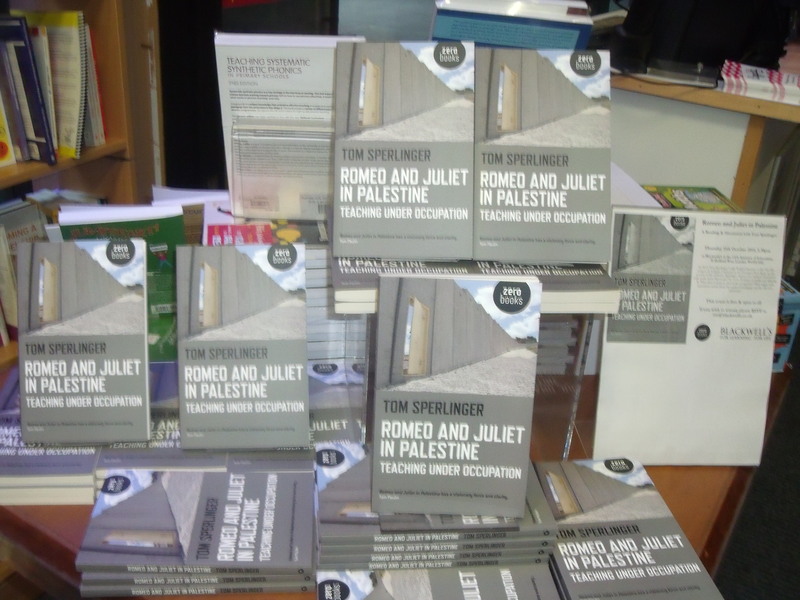 Tom Sperlinger is the author of a new book Romeo and Juliet in Palestine: Teaching Under Occupation. 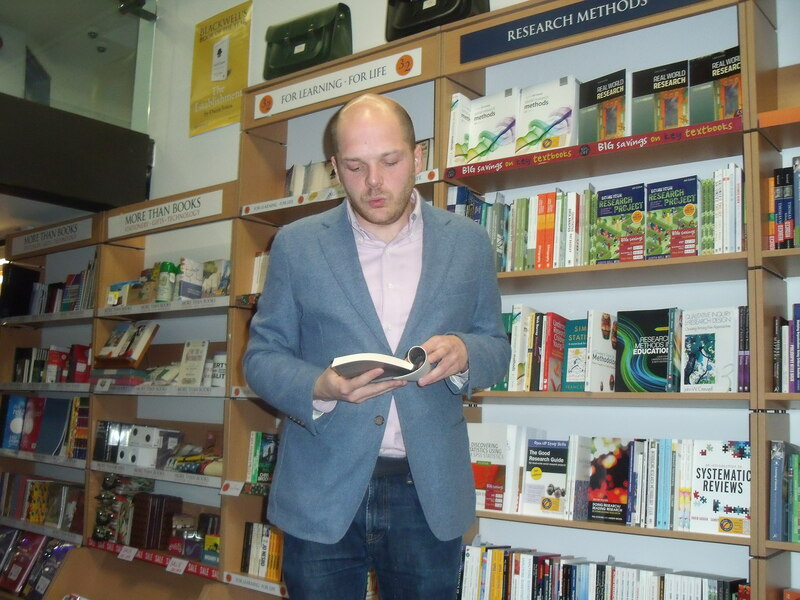 He launched the book last Thursday at Blackwell’s bookshop in the Institute of Education. Sperlinger is Reader in English and Community Engagement at the University of Bristol and this is his first book. He has also been a regular contributor to the Guardian on education issues and his new book was reviewed in that very newspaper. In 2013 Sperlinger taught English literature at the Abu Dis campus of Al Quds University for a term. The book is an account of his time there and the affinity he built up with Palestinian students while teaching them works like Hamlet and Romeo and Juliet. 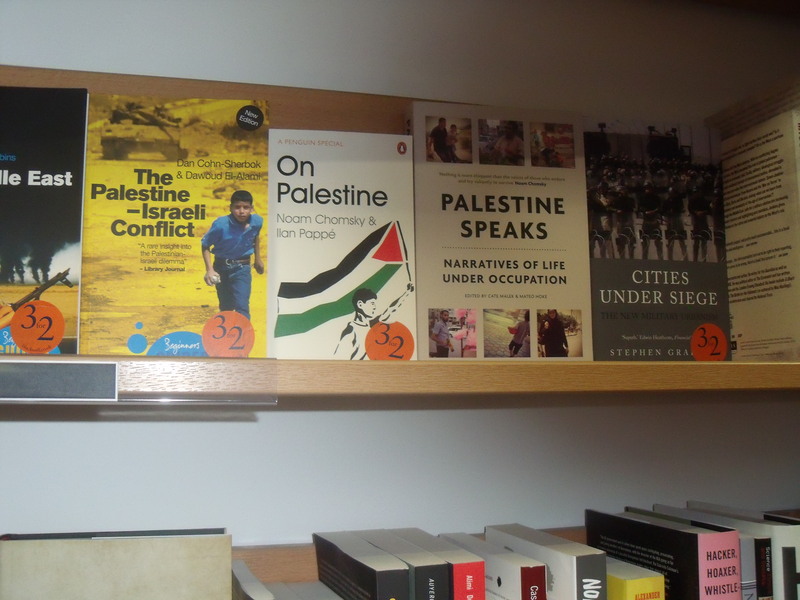 However, from what I read of the book at the event it is just another anti-Israel diatribe which will now go into bookshops and libraries and onto student reading lists. Before going into Sperlinger’s account of his time at Abu Dis the book opens with the usual biased account of Israel’s creation. Anti-Israel author Ilan Pappe is heavily quoted and Sperlinger mentions Ali Abunimah and Jeff Halper, both anti-Israel propagandists, for their writings on the so-called one state solution. Sperlinger goes on to describe an Israeli soldier kicking a Palestinian child as the child is going to visit his father’s grave (P. 108). 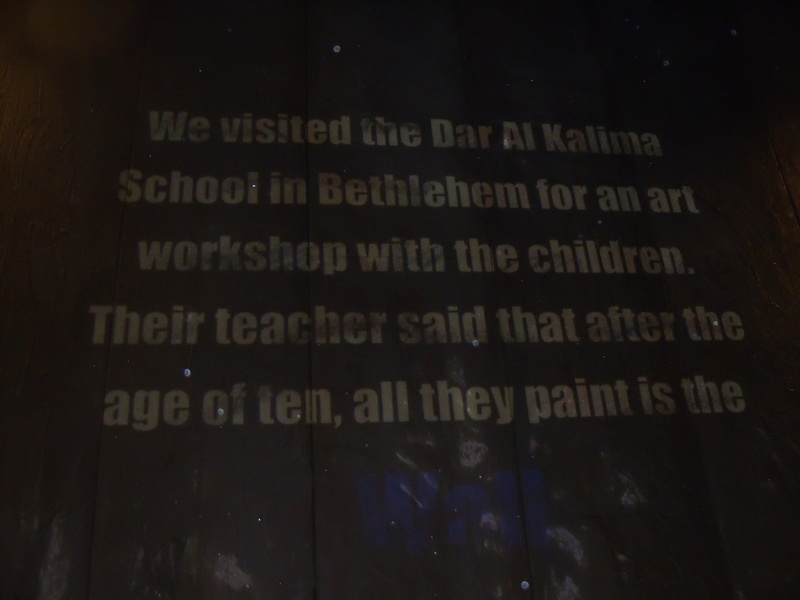 He also describes how he helped in the translation of the play Seven Jewish Children when it is staged by Palestinian students at Abu Dis (P. 65). Seven Jewish Children is a very short anti-Semitic play which portrays Jews as slowly metamorphosing from being victims of the Holocaust into baby-killers. When I put this to him Sperlinger didn’t agree Seven Jewish Children is anti-Semitic. He also didn’t agree that a poem by Tom Paulin is anti-Semitic. Paulin has given an endorsement of Romeo and Juliet in Palestine for its front cover. 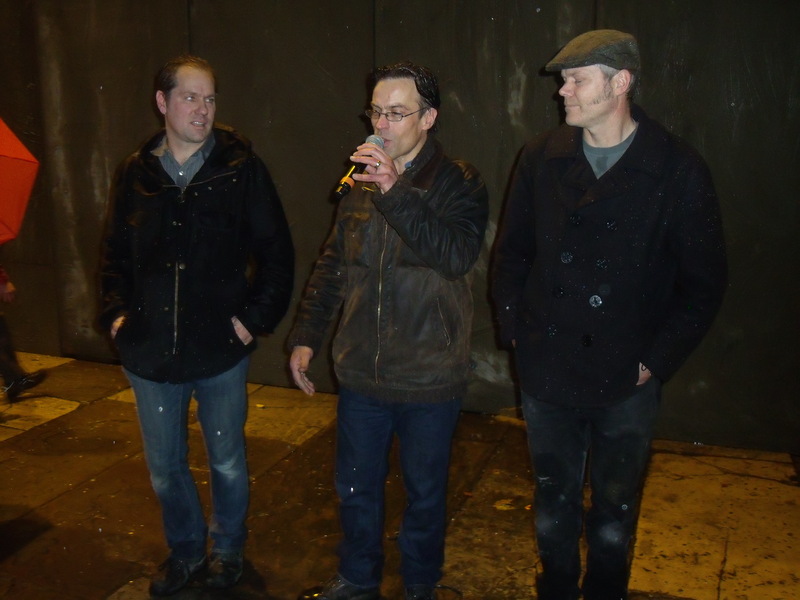 I questioned Sperlinger about the poem and whether he might consider having Paulin’s endorsement removed in light of it. Sperlinger said he didn’t find Paulin’s poem anti-Semitic. The CAMERA article states that the quote chosen by Paulin to precede his poem is also anti-Semitic. Considering Sperlinger is a Reader in Community Engagement it would have been reassuring for the Jewish community to think that he at least had a problem with “Zionist SS”, “dumb goys”, “Zionists…nosing after blood” and Seven Jewish Children. Sadly, it seems, this isn’t the case. Blackwell’s selling Sperlinger’s book with Tom Paulin’s endorsement on front cover. British psychotherapists gear up for racist boycott of Israeli psychotherapists. 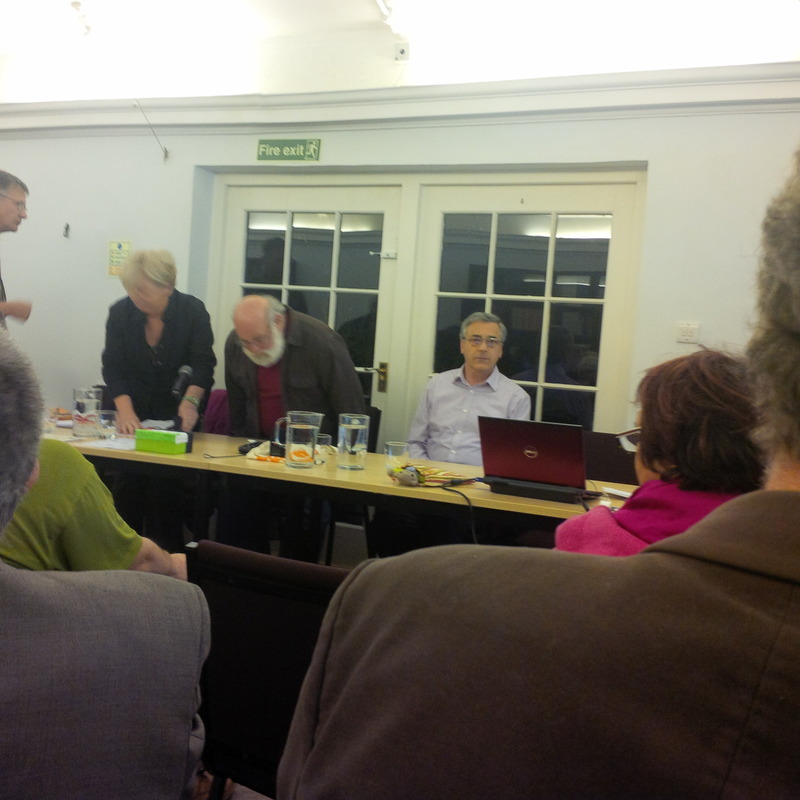 Martin Kemp, Teresa Bailey, Jeff Halper, David Harrold at the Guild of Psychotherapists, Nelson Square, London on Wednesday night. 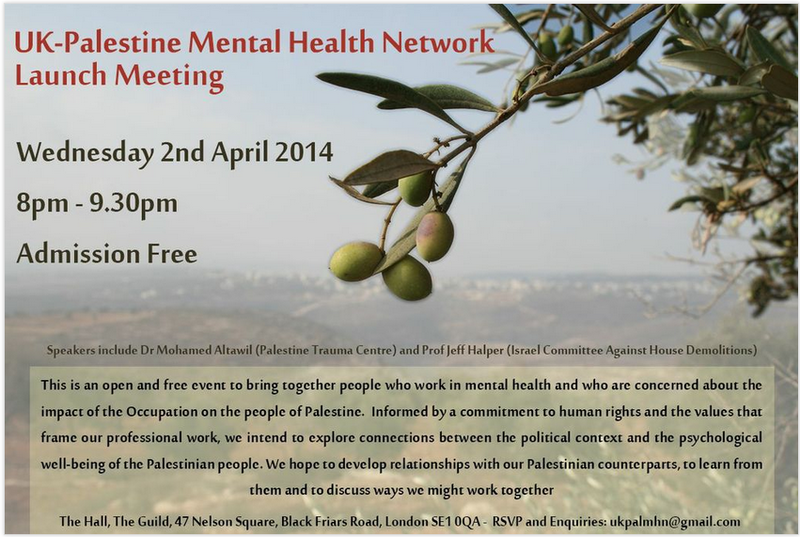 On Wednesday night I found myself sitting among 60 or so psychotherapists and mental health workers at the Guild of Psychotherapists in London for the launch meeting of the UK-Palestine Mental Health Network. The four panelists were David Harrold and Mohamed Altawil, both of the Palestine Trauma Centre UK, psychotherapist Martin Kemp and ubiquitous Israel-hater Jeff Halper of Israeli Committee against House Demolitions. Chairing the evening was psychotherapist Teresa Bailey. The evening was supposed to be about helping the Palestinians but, as ever, it quickly dissolved into an evening of unmitigated attacks on Israel and Zionism, and calls for a boycott of the Jewish state. Contributions from panelists were very short so as to encourage comments from the audience. First to speak was Altawil who discussed Post Traumatic Stress Disorder suffered by Palestinian children. He said the biggest trauma was when Palestinian children lost their houses and he accused Israel of “working to kill Palestinians from the inside”. Harrold said Palestinians were in an “abusive relationship” shown by Israeli politicians talking about “putting Palestinians on a diet” and how they “must be made to feel a defeated people”. He said the Palestinians had been “reduced to a level of thinking only about the problem of survival, nothing else”. Harrold continued “if you are sane you are going to resist” and he then listed certain ways of resisting which included “rockets and martyrs’ funerals”. He said he did not endorse such methods. He didn’t say he denounced them either. Halper, who wishes to boycott Israel out of existence, called for the mobilisation of “civil society”. Kemp criticised David Cameron for “declaring himself rock solid in his support of Israel”. Kemp described politicians who speak up in support of Israel as “hypocritical” and he invoked Ghada Karmi, Ronnie Kasrils, Desmond Tutu, Alice Walker, Angela Davis and Judith Butler to support his notion that Israel has an “apartheid system”. Kemp finished by saying that “the west’s embrace of Zionism is having a detrimental effect on our own political culture”. From the floor Derek Summerfield, a senior lecturer and another seemingly vicious anti-Israel polemicist said “boycott is the only tool” and David, a young social worker in London who didn’t give his surname, suggested they should “hit Israelis economically”. Andrew Samuels, a founding member of Jews for Justice for Palestinians, a psychotherapist, political consultant and professor of Analytical Psychology at the University of Essex, seems to be a master of the dark arts of which his ideological mentor Carl Jung would not have approved. Samuels suggested the Jewish community would respond to a political move couched in terms of “mental health and therapy”. He was “excited about setting up a line of influence that ends up in governmental circles” and the “prestigious meeting rooms in Parliament” which would be provided. He said “histrionics, the worst case scenario, emotional blackmail and all that kind of thing” should be used. Margaret McCallin, an elderly English lady and a retired psychotherapist, said that “the mental health of the Palestinians must be seen in the context of violation of human rights and the ongoing violence from which these people see no end”. She said that despite the way the Palestinians live in Gaza “they don’t get up and start slaughtering the Israelis on the border or any of the others”. How delightfully generous of her. Finally, Teresa Bailey took a vote to gauge support for the UK-Palestine Mental Health Network and quoted Martin Luther King’s “what is remembered are not the words of our enemies, but the silence of our friends”. There were many other vicious comments about Israel from the floor, yet not one mention of Palestinian terror group Hamas and its real oppression of Palestinian women, gays and dissidents. So expect a racist boycott of Israeli psychotherapists and mental health workers along the lines of the RIBA boycott of Israeli architects anytime soon. 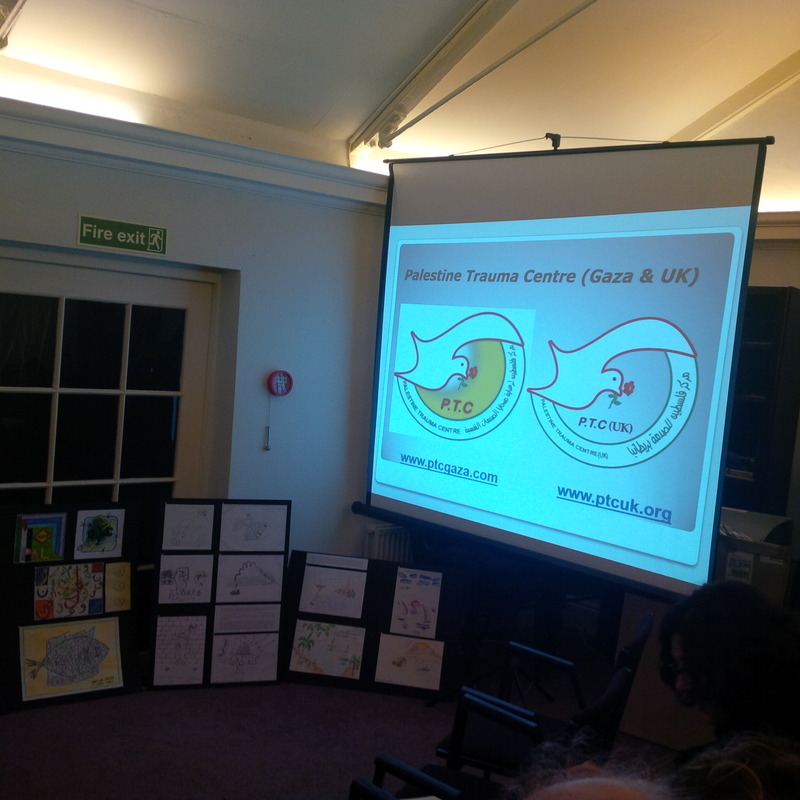 Wednesday night at Guild of Psychotherapists. 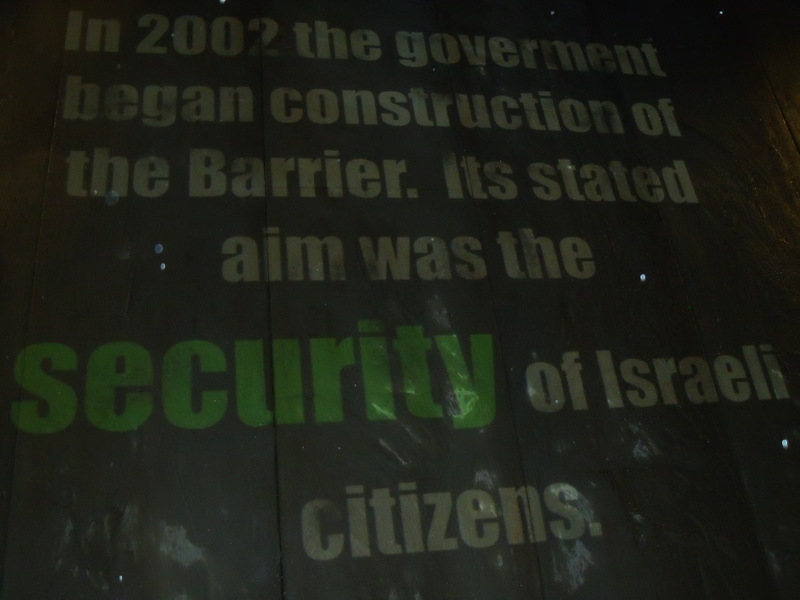 St James’s Church, Piccadilly, installs life size replica of Israel’s security wall during 12 days of Christmas. 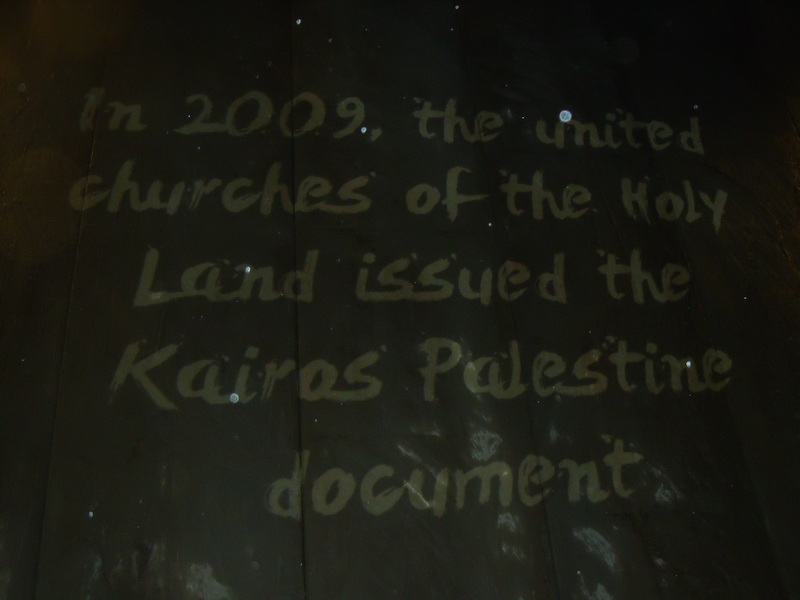 The life size replica wall at St James’s Church, Piccadilly for Bethlehem Unwrapped. St James’s Church, Piccadilly, in London’s West End has installed a life size 8 metre tall/30 metre long replica of Israel’s security wall in its courtyard as part of its Bethlehem Unwrapped festival. The replica wall is so vast that it obscures the Church itself. The replica wall will be lit up at night and for the next twelve days of Christmas (until 5th January) a montage of images and slogans will be continuously projected onto it. Scenes include parts of London with a wall passing through it. What you won’t see projected onto the replica wall are scenes of bombed out Israeli buses, hotels, pizza restaurants, bars and nightclubs that were ubiquitous in Israel before the wall. 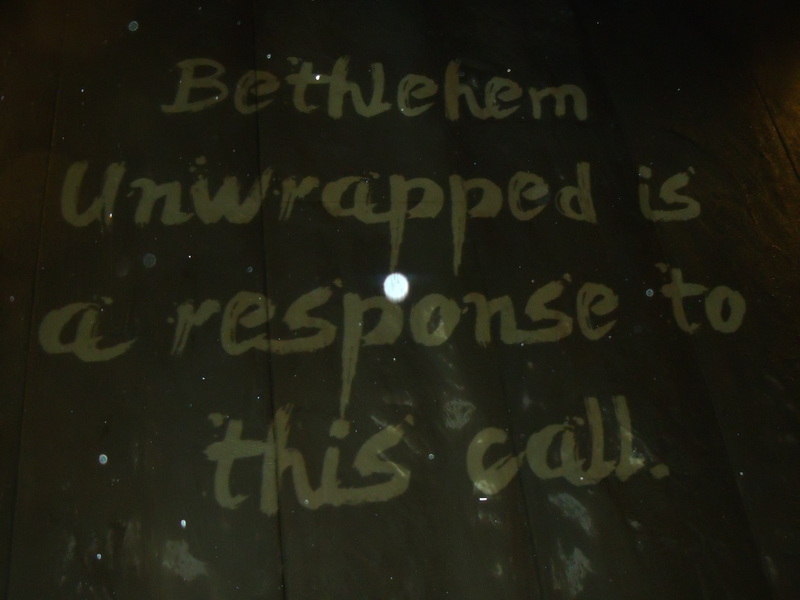 Bethlehem Unwrapped has evening events with anti-Israel polemicists including comedians Jeremy Hardy and Ivor Dembina, musician Nigel Kennedy, columnists Yasmin Alibhai-Brown and Mark Steel, Jeff Halper of Israeli Committee Against House Demolitions and War On Want’s in-house poet Rafeef Ziadah. 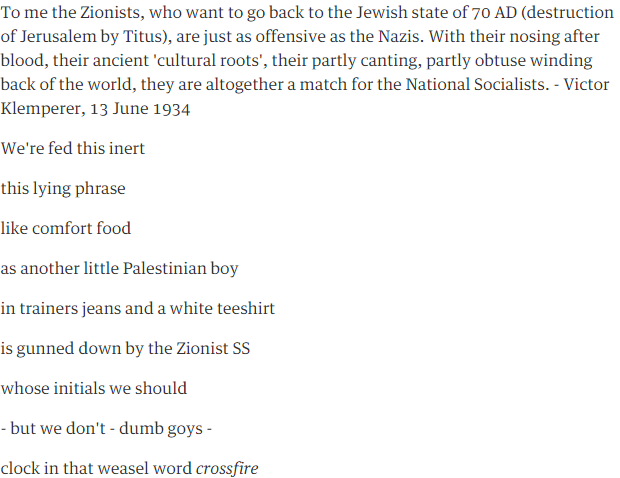 Maybe Ivor Dembina will reprise his notorious Holocaust “joke” in which he mocks the Jewish people for wanting to hog the Auschwitz limelight. According to Dembina Jews don’t really want others to know that gays, gypsies and the disabled were also murdered at Auschwitz because we like to see it as “Ourschwitz, not Yourschwitz”. Had someone made a joke about, for example, Srebrenica they would rightly be excluded but Dembina, host of the Hampstead Comedy Club, is one of the star turns at Bethlehem Unwrapped. Or maybe poet Rafeef Ziadah will reprise her praising of Islamic Jihad chief Khader Adnan. Adnan, you may recall, is keen to incite Palestinians to become suicide bombers and blow up innocent Israeli children. Unbelievably, into this political hatefest have stepped the supposedly “non-political” chefs Yotam Ottolenghi and Sami Tamimi. They will be hosting the “Bethlehem Feast” at the church on Friday January 3rd. Last night’s unveiling of the replica wall was introduced by St James’s Church Rector Lucy Winkett. 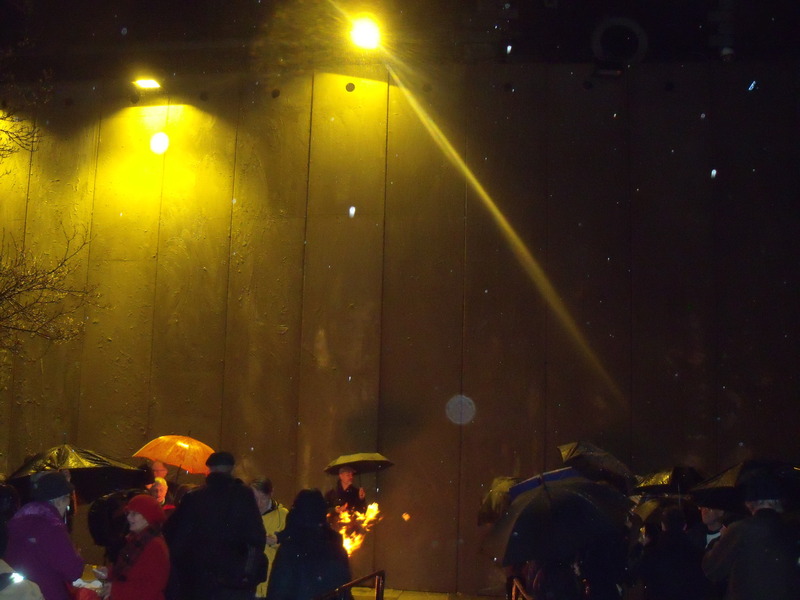 Rector Winkett said the reason behind the replica wall was that when 20 of them visited Israel and the Palestinian territories in October “one of the lasting memories of our time there was this wall” (see clip). It is a shame Rector Winkett didn’t also visit the graves of Israeli children murdered by Palestinian suicide bombers or Israelis left disabled by them. 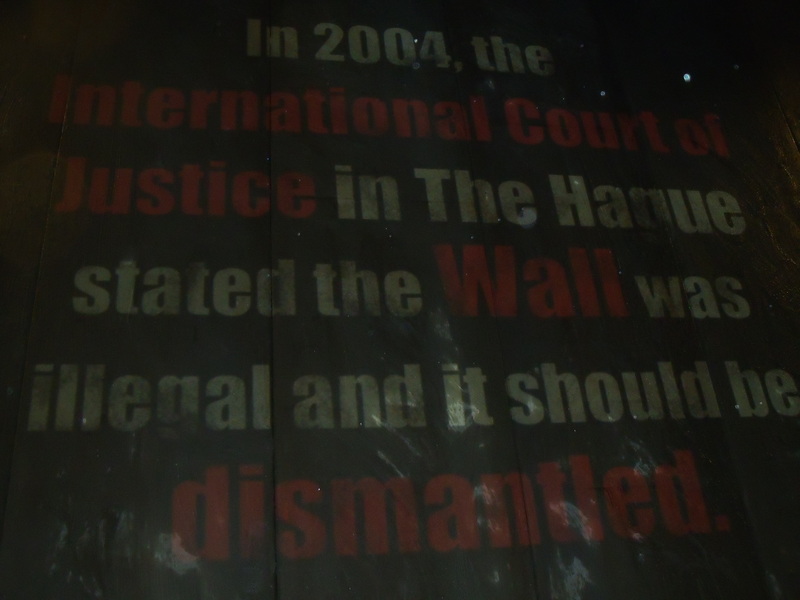 The microphone was then handed to Jeff Halper of Israeli Committee Against House Demolitions who left those who made it to the church despite the dreadful weather conditions in no doubt as to what the next twelves days of Bethlehem Unwrapped had in store. Halper has previously expressed his wish to boycott Israel out of existence. Last night Halper described Israel’s security wall as a “very deadly barrier that people cannot pass” and said “this wall is not built for security…it doesn’t protect Israelis in any way”. He continued “the wall defines the borders of the Israeli bantustan that is being created for Palestinians in an apartheid state…it defines those cantons in which Palestinians will be confined” (see clip below). I understand that there are due to be a couple of last minute voices putting Israel’s case at the panel debate with Halper “Both sides of the Barrier: Separation or Security?” on January 4th but it is a drop in the ocean when compared to what is taking place over the entirety of the festival. During the festival members of the public are being invited write on the wall. The address of St James’s Church is 197 Piccadilly. It’s very close to Piccadilly Circus tube station. Feel free to head away from the sales for a few minutes to balance out the hate and the lies. But take a good pen with you. This replica wall has possibly cost thousands of pounds. There have been designers, architects, curators, materials, scaffolding and a team of builders. 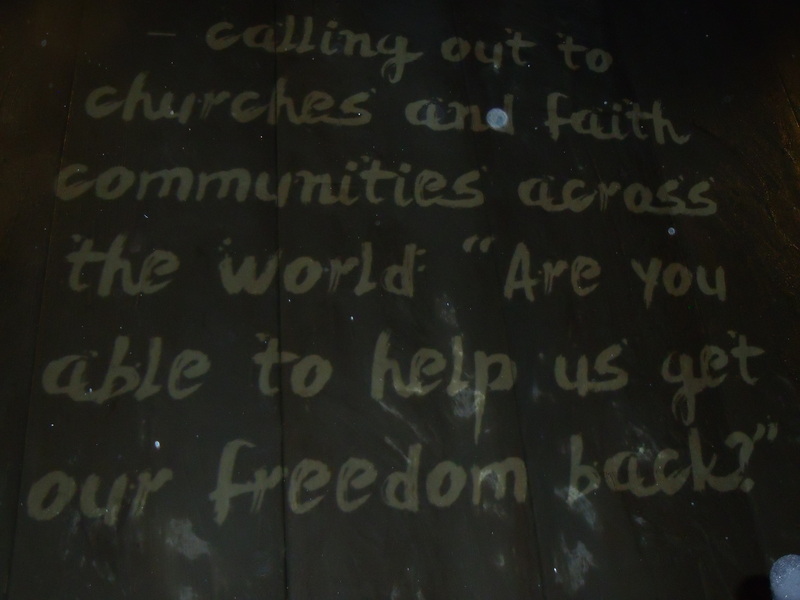 With mouths to feed and people freezing to death in this country alone it is shameful that St James’s Church, Piccadilly, has squandered so much on what is nothing more than an anti-Israel propaganda exercise. 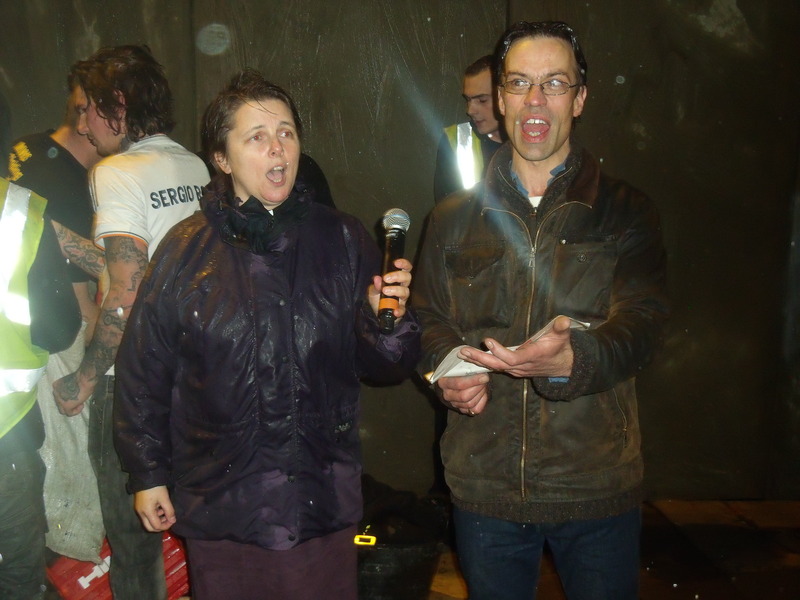 St James’s Rector Lucy Winkett and replica wall curator Justin Butcher singing “oh Little Town of Bethlehem” last night. Justin Butcher with the replica wall’s architect and its designer last night. 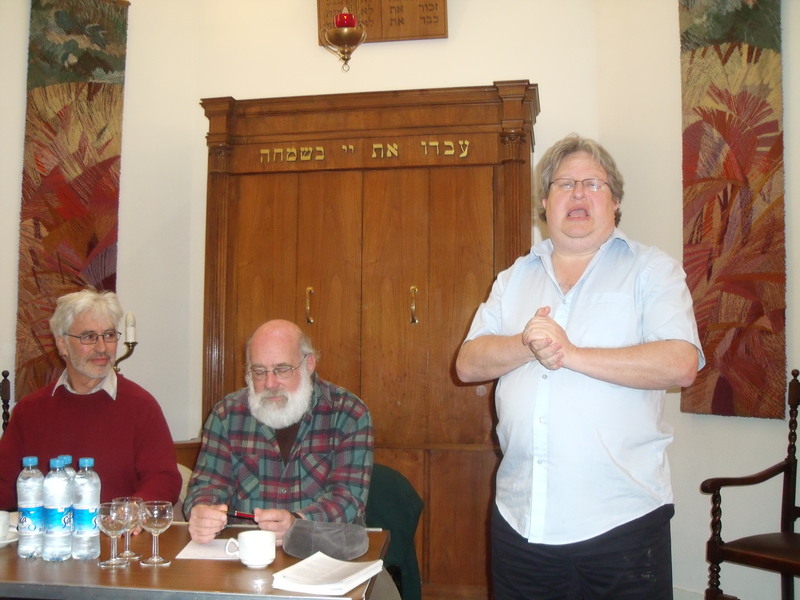 ICAHD’s Jeff Halper speaks to London churchgoers of Israeli “super Apartheid”. 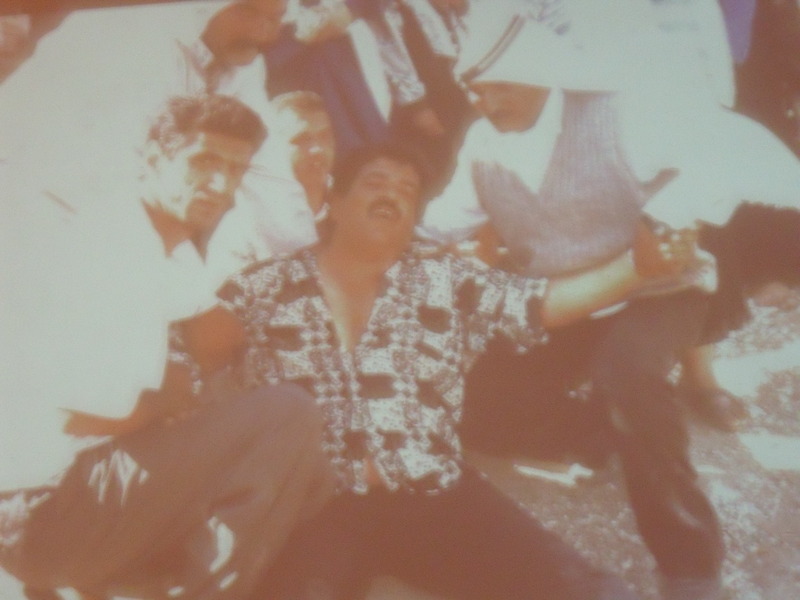 Halper's slide of Salim Shawamreh after a house demolition. Jesus is reborn in the form of Jeff Halper of the Israeli Committee Against House Demolitions (ICAHD). Halper sacrificed himself to leave sunny Israel and visit rainy London for a speaking tour. He appeared on Monday night in the ancient church of All-Hallows-on-the-Wall in the the City of London to talk about the plight of the Palestinians. Halper, like Jesus was, is also Jewish, and, just like Jesus, has suffered incredible hardship for the sake of others. The blurb for the speaking tour described Halper as being “prepared to put his own comfort and safety at risk. He dismisses the physical hardships, manhandlings and brief sojourns in Israeli jails which he has endured, as insignificant compared to what Palestinians may suffer every day”. Halper was supposed to have been joined by Salim Shawamreh (see photo above) who owns a house called Beit Arabiya, but Shawamreh was absent eventhough the event was meant as a fundraiser to help him rebuild his home which had, apparently, been demolished for the fifth time by Israel. On previous occasions Halper had been there to help rebuild it. Halper describes such rebuilding “as a political act of resistance until we prevail”. Has there been a falling out between Halper and one of his main disciples? I expected to hear how Shawamreh had been detained by the Israeli authorities. The blurb for the talk simply stated “Unfortunately Salim Shawamreh whose family owns Beit Arabiya was due to be at this event is no longer able to join us.” Halper had nothing more to add to that on the night. In Shawamreh’s absence Halper couldn’t resist the urge to raise funds for himself. He told us that the moment he was thrown down a hill with Shawamreh he pledged to tell his story. His publicist then offered us the chance to purchase Halper’s book An Israeli in Palestine for £12. Halper immediately told the 100 or so Christians (and one Jew) in the church how deceitful the Israelis were. Conveniently forgetting the many Israelis murdered or left disabled and disfigured by Palestinian suicide bombers Halper said that the “separation wall”, like most other Israeli policies, had nothing whatsoever to do with security and that discussing the wall in such terms made Israel sound like the victim. It helped Israel claim “we are the good guys, they are the bad guys” as Israel tried to “reframe the conflict”. According to Halper, the wall is twice as high as the Berlin Wall was and five times as long. Halper said Israel has demolished 27,000 Palestinian homes since 1967 and in only around 600 of those instances was security of possible concern for Israel. And he said that the “settlements” had nothing to do with security either. Halper didn’t think there was a proper conflict, which needed two sides; Israel is too powerful due to its vast business dealings with Britain, its official treaty with America and its economy which is three times the size of Egypt’s, Palestine’s, Syria’s and Jordan’s combined, not forgetting Israel’s nuclear prowess. Halper said most Palestinians live on £1.50 a day with no access to the Israeli job market and that Israel is driving middle class Palestinians out. He said that the Palestinians are so regulated they even need permission to plant gardens next to their homes and for growing certain flowers. Ever the hero, Halper went on to describe his brave actions during proposed house demolitions. Being an Israeli Jew, he said, meant it was more unlikely that he would be imprisoned. This allowed him to throw himself in front of bulldozers and to climb onto the roofs of those houses earmarked for demolition. He mentioned Rachel Corrie who, he said, was “killed after being twice run over by a bulldozer”, and a pregnant Palestinian mother of ten who died after her house “was demolished while she was asleep inside”. Such a simple solution and one which Israelis are bound to go for in their droves despite the prospect of living right next door to the likes of Hamas and Hezbollah terrorists dedicated to the slaughter of Jews! I doubt even Israel’s Arab citizens would go for it. Meanwhile, if anyone catches sight or sound of Salim Shawamreh, please let me know as I’m concerned as to his whereabouts. Photo on flyer for last night's Palestinian Child Prisoners event held at NUT. Israel hate came to the National Union of Teachers last night when the PSC was allowed to hold one of its meetings at the NUT’s sumptuous Hamilton House HQ in Euston, London. About 80 teachers heard PSC Honorary President Betty Hunter call for a boycott of security firm G4S because of its work with Israel. G4S is tasked with securing the Olympics. Imagine the chaos in the UK this summer if the PSC had its way. Chairing the event was Geoffrey Bindman of Bindman’s solicitors and the event was opened by Kevin Courtney, the Deputy General Secretary of the NUT, who welcomed us. The title of the event was Bound, Blindfolded & Convicted: Palestinian Child Prisoners and the main speaker was Gerard Horton of Defence for Children International – Palestine Section who presented us with his organisation’s just released report Bound, Blindfolded & Convicted: Children held in military detention. Horton had recently presented a similar talk at this year’s NUT annual conference. Here is the 144 page report which took four years to compile. The report was based on interviews with 311 Palestinian children mainly aged from 14 to 17 (116 were 14-15 and 176 were 16-17). 97% of the testimonies were by males. Most arrests were for alleged stone throwing. The report also contains 25 individual case studies of alleged bad treatment and/or torture by Israel. The range of common complaints of the 311 included hand ties (95%), blindfolds (90%), physical violence (75%), detention inside Israel in violation of article 76 (63%), arrested between midnight and 5am (60%), confession during interrogation (58%), threats (57%), verbal abuse and/or humiliation (54%), strip searched (33%), transferred on floor of vehicle (32%), signed/shown documents written in Hebrew (29%), solitary confinement (12%). So either Israel has a lot to answer for in its treatment of Palestinian children or someone somewhere is making a lot of money at the taxpayers’ expense producing what amounts to nothing more than anti-Israel propaganda. Its revenues in 2008 were $1,084,357. Known support includes a 600,000 Euro grant from the EU for the period 2009-2012 for a project called “Promoting and protecting the rights of Palestinian children affected by armed conflict and occupation.” It is receiving $639,000 from Denmark, Switzerland, Sweden and Holland and £12,500 from the UK. It is an active supporter and promoter of boycott campaigns against Israel. It supported the Goldstone Report. It published a list of 352 children who died during Operation Cast Lead but some of them have been identified by B’Tselem as combatants. It continues to promote the libel of a “Jenin massacre” on its website. It calls for Israel to recognise the “right of return” for Palestinians. The main problem with the report is that, unless I am missing something, you cannot properly identify any of the 311 who gave testimony. There is also an interview with an Israeli soldier from Breaking The Silence where the interviewee is merely known as “Soldier”. Last night Gerard Horton quoted from Breaking The Silence’s own website, a website that, again, contains anonymous testimony from Israeli soldiers. But surely, with the alleged offences being so serious some people, at least, need to be named. As a solicitor Geoffrey Bindman, himself, would acknowledge that the report lacks credibility and wouldn’t stand up in a proper court of law. Gerard Horton seemed to be very pleased with himself that testimonies from 311 people had been taken. But even if the report was based on the testimonies of 3,110 people the result is the same if they are anonymous. After his short talk Gerard Horton showed us this Defence for Children International propaganda clip starring both himself and anti-Zionist activist Jeff Halper who wishes to boycott Israel out of existence. We are shown Palestinian children with bruised eyes and swollen wrists allegedly inflicted by Israeli soldiers, but who really knows the truth behind the bruises and swellings. On her way out one of the teachers told me that Israel is acting like the Nazis did. It’s a frightening prospect if any of your children are being taught by her. In the meantime NGOs like DCI- PS need to be producing properly substantiated reports. Only then can the quote by Mark Regev, that Gerard Horton is so keen on, that “The test of a democracy is how you treat people incarcerated, people in jail, and especially so with minors” be tested with reference to Israel. Otherwise what is the point of this NGO being heavily financed by us, the taxpayer? And what is a union like the NUT doing hosting what amounted to an evening of anti-Israel propaganda? Hasn’t the NUT got enough problems to sort out for its own members? For most Jews it might seem incongruous to attack Israel from in front of the Aron Ha-Kodesh but not for Jews for Justice for Palestinians and not for some from Liberal Judaism which hosted Jeff Halper of Israeli Committee Against House Demolitions (ICAHD) at the Montagu Centre. Halper is an American who has lived in Israel for 40 years. His talk was titled The Problems of a Peacenik in Israel: Attacking the messenger. Extraordinarily, at the end Halper came over to me to specifically state for the record that he “supports boycott, divestment and sanctions against Israel” and he agreed that he is going round British universities both calling for those and describing Israel as an apartheid state. 2. Said the population of Israel is only 70% Jewish. 30% are not Jewish including Russian immigrants and foreign workers and their families. Adding four million Palestinians has made Israel a binational reality. Jews in the diaspora must let Israel go. What Zionism did to the Jewish people was terrible. It negated diaspora Jews. 3. Told us that if diaspora Jews respect Israel they have to respect its right to evolve as a country and find its own place in the Middle East. It isn’t in Europe. After World War One Chaim Weizzman said: “We want the Land of Israel to be as Jewish as England is English.” That made sense in 1919 in England but England could evolve and go somewhere else. England has become a very different country. Bradford has a majority non-white population. You can now become British even if you are from China. 5. Stated that the majority of Jews have always lived in the diaspora and that their national identity is based on the Torah and the book of Joshua (the book of conquest) which is tribal and genocidal and which is where Zionism took its Judaism from. The prophets, however, articulated human rights and liberal humanism. The values Israel talks about are unacceptable to diaspora Jews and that Jerusalem should be Jewish is a racism people would never accept in Britain. Halper never mentioned the spectre of Islamic Fundamentalism, twisted history by saying the Jews had rejected a two-state solution in 1948 and said that Jewish children were being “brainwashed” by the likes of Birthright Israel. This brainwashing accusation is becoming a common theme against anyone who puts forward Israel’s position. Finally, after two-hours of advocating a one-state solution, despite his ridiculous denials, Halper even gave us its name: Palestein.